Blood flow tubular reabsorption of water and sodium result in large changes in urinary excretion of these substances. D How is the peritubular capillary adapted for reabsorption? B Which substances present in the glomerular filtrate are not normally present in urine? B Which mechanisms reabsorb solutes from glomerular filtrate? Q Define renal plasma threshold. B Describe the role of passive transport in urine formation. 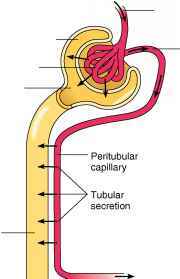 In tubular secretion (tu'bu-lar se-kre'shun), certain substances move from the plasma of the peritubular capillary into the fluid of the renal tubule. As a result, the amount of a particular chemical excreted in the urine may exceed the amount filtered from the plasma in the glomerulus (fig. 20.21). As in the case of tubular reabsorption, the term tubular is used because this process is controlled by the epithelial cells that make up the renal tubules. Active transport mechanisms similar to those that function in reabsorption secrete some substances. However, the secretory mechanisms transport substances in the opposite direction. For example, the epithelium of the proximal convoluted tubules actively secretes certain organic compounds, including penicillin and histamine, into the tubular fluid. Hydrogen ions are also actively secreted throughout the entire renal tubule. As a result, urine is usually acidic by the time it is excreted, although the urinary pH can vary considerably. The secretion of hydrogen ions is important in regulating the pH of body fluids, as chapter 21 (p. 871) explains. 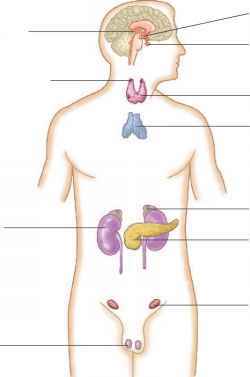 Surgery is the primary treatment for cancer of the kidneys. However, in half of all cases, cancer returns, usually in the lungs. A treatment for this metastatic kidney cancer is the immune system substance interleukin-2. It is administered intravenously in cycles in a hospital setting because of sometimes severe side effects. Interleukin-2 presumably stimulates the immune system to attack tumor cells. In about 15% of patients, this drug shrinks lung tumors.